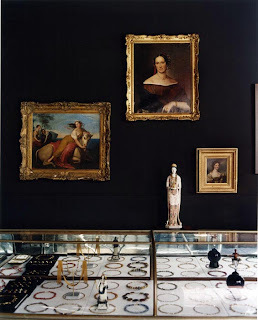 Federico de Vera’s glorious enchantment of a store/gallery has attracted friends and clients like Giorgio Armani and Karl Lagerfeld, as well a world of art directors, film directors, movie stars, art dealers, fashion designers, obsessive collectors, photographers and interior designers. They find their way to One Crosby, near Lower Broadway, and linger for hours, delighted and dazzled. Imagine this: I was in New York a handful of years ago for meeting with my publisher. It’s a hot summer day. I dash around—the Met, the Neue, the Frick, and then West Village and SoHo. Quick cold drink at Dean & Deluca and then I walk over to the corner of Crosby Street, just opposite Ted Muehling’s legendary shop/studio on Howard Street. Federico de Vera, a dear friend for years in San Francisco, had told me he was almost ready to open his gallery in a handsome brick building, and I was hoping to see him. And there he was! Sitting on the steel steps outside the store, he was taking a break from installations. “One Crosby is a powerful address and concept and I am sure it will be good luck,” I responded. So One Crosby it is. And Federico has made this hidden gem a great good luck story—inspiring designers and artists and drawing everyone who loves beauty, eccentricity, and lovely jewels and inspiring objects. Come with me for a visit—and meet Federico de Vera, a beloved, elusive, talented and glorious man of the world. 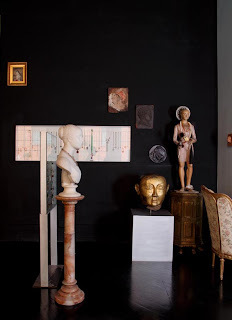 DDS: Your New York gallery, De Vera, is like a magical mystery tour, a dreamscape, a visit to European cabinets of curiosity, out of time, out of mind, wonderful and inspiring. How do you view it and how do you approach each presentation? FDV: I am always trying to tell a story, attempting to show things and perspectives that most people overlook. I see my job more as a curator than a dealer. Working for myself gives me the freedom to find pieces that I find interesting and displaying them in an unconventional manner. 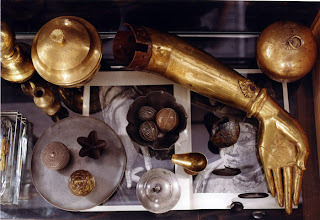 What most people don't realize is that beautiful objects and arrangements are like architecture. A beautiful piece improperly displayed loses some of its luster and an ugly piece displayed in the most flattering manner is still ugly. DDS: I visited the space at One Crosby before you opened—and it was just a very promising space with high ceilings and vast windows and old wood floors, brick walls. Now it's a mystical place...like going to a mediaeval cathedral in Antwerp or the Loire Valley or Rome, or like finding an old and dark antique shop in Paris, hidden away on the Left Bank. But there is nothing like this in the world. How do you select pieces? What are your criteria? FDV: Every single object goes through a vetting process according to my standards. I never have objects in the shop for specific clients nor have them so I can just sell them and make money. The objects have to be beautiful first of all. Provenance and price don't really matter much to me. It is always interesting to know what people find beautiful in each one of these objects because very often it's the same reason why I have them. I always think that each one of these objects belongs to a "someone" out there in the universe, and that as long as that "someone" has not found it yet, I remain its guardian. DDS: You have deliriously beautiful and strange and glorious objects from around the world. 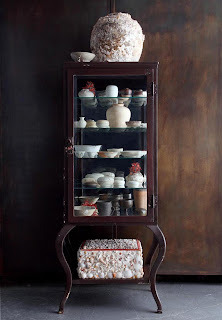 I especially love the 'cabinet of curiosities' pieces—with hands of saints, Japanese carvings, coral branches, precious stones, and shells and lovely things from the natural world, a continuing theme for you. FDV: I guess that everyone imagines his or her own cabinet of curiosity. In my case, it's a little old fashioned, old world, natural and dark. It's been haunting me since I was a kid and has been my friend ever since. I still like to embrace what I find is spiritual, forbidden, mysterious and unfathomable. It gives me an endless source of fascination and I never get tired of it. DDS: You have a great eye for religious relics—which in your hand take on a power and beauty that is rare today. FDV: I was brought up in a very Catholic family and we went to church every Sunday. 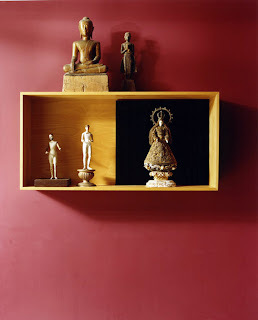 Perhaps out of boredom, I became fascinated with religious statues and paintings. They were always rendered very realistically and I imagined them to have lives of their own. I have always analyzed their expressions and wondered what thoughts they had. The fact that they were sacred made them more intriguing. They were magical and mystical. I wondered what power they possess. DDS: You adore the natural world. 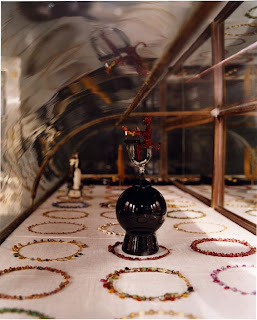 Beetles, coral, shells, stones, gems and jewels are all offered homage in your store. FDV: Nature is the best designer. I've always been fascinated with nature growing up in the country in the Philippines. We would go to the beach house every weekend and I imagined what beautiful objects lay underneath the ocean. I was always foraging the beach for something new to take home. My mother loves jewelry. I have always been fascinated with the depth of the color of gems and the sparkle of diamonds. I am bewildered about where it all comes from. That nature has created such beautiful materials, which is turned into jewelry, is an art form that always fascinated me. It's like asking the question: how can you make something already beautiful even more beautiful? 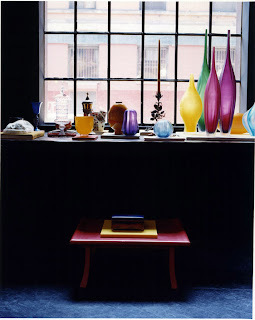 DDS: I like the way you collage modern pieces—like the hand-blown glass—with ancient and vintage and merely old. FDV: A beautiful object is still a beautiful object no matter what age or material. It is always interesting and enlightening to see modern and antique juxtaposed. It's about being open-minded and trying to appreciate things for what they are. And that's what I try to impart to everyone who is willing look. DDS: Portraits! You have such an eye for compelling and humanistic and emotional portraits. FDV: I don't think that I'm a good illustrator so I always appreciate a good portrait. The rendering of the distillation of a gesture, a mood and a thought in a painting is one of the most challenging skills an artist encounters. I imagine the time when these portraits were painted - what these people were thinking about just as they sat still for hours or days, and how the painters captured those ever changing moods. Sometimes, I find myself staring at the pictures and imagining what they would be thinking if they knew I was staring at them. FDV: The best stone dealers are in the United States, and the best antique jewelry dealers are in London. I try to work with dealers who find interesting materials and who are not stuck in the classic 4C's or GIA certificates. I like beauty that is not necessarily the stone that is clear. Inclusions can be beautiful. Since I am drawn to Greek, Medieval, Renaissance, Georgian and Victorian jewelry, I combine new and old parts to make every single piece. I almost never sell a piece of antique jewelry in its original form. DDS: How often are you traveling to find objects? Where are you going next? FDV: I'm in California at least once a month to visit my store in San Francisco and to find interesting objects. I also travel to other places like Venice or London or Paris about three to four months out of the year. I might go to the Maastricht art fair this March but only for research and inspiration. I look for interesting objects everywhere I go. Who knows what you can find at that neighborhood thrift store? The only tools you need are an eye, open-ness, and knowledge. DDS: What's the oldest piece you have here? Geological pieces and stones? FDV: Of the manmade objects, it is the Bactrian agate bowl that dates back to 2000 BC. It has a very contemporary form, with a wide mouth tapering down to a precariously slim base. Of the natural objects, the pietra paesinas (landscape stones) which are 23 to 145 million years old. They are naturally occurring stones that come from a certain part of the Tuscany region. When expertly sectioned and polished, they reveal an otherworldly landscape. So rare are these stones that in the 16th century, the Medici family had monopolized its distribution and use. DDS: I think you love bewitching your friends and clients! I am almost dizzy within seconds when I look at your collages and displays. Hallucinatory! FDV: Most of the time, I like good sensory overload. It's almost like when you are reading a good book that you cannot put down and at the same time trying to read it slowly so you can savor every word and imagine every detail. As you get close to the last page, you feel a little melancholy because soon this little book will have to be closed. But in the end, it is the pleasure of reading that book that you will always remember. That is what I aspire my work to be. DDS: Can you namedrop a little? I was in the gallery one day and Giorgio Armani was there. I know Ted Muehling drops in from his jewelry shop and workshop across the street. And I know Marc Jacobs and Leonard Lauder are collectors. You're a favorite for anyone looking for an original gift for a loved one. FDV: I have something in common with everyone who appreciates the objects in my shop even if it's just one piece. However, we do have some very interesting clients in the creative field: Valentino, Bruce Weber, and Michael S. Smith, Paul Smith, Jonathan Ives, Claire Danes, Steve Jobs, Michael Maharam, Francisco Costa, Mario Sorrenti and Daniel Day Lewis among others, and many talented friends, many ultra-private people with great style. I love them all. DDS: Federico, thank you so much for this superb visit. I look forward to seeing you and de Vera again soon. It's a spiritual experience to view such rare beauty. Thank you. All De Vera gallery photography here by the wonderful New York photographer Don Freeman, who recently published the glorious monograph on Ted Muehling and his designs (published by Rizzoli). 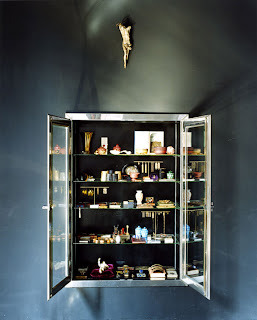 It's a walk in cabinet of curiosities;) And oh so appropriate to be located by Ted Muehling as well as BDDW, what great synergy between the spaces. Diane, I want my house and studio to look like De Vera- imagine the variety of endless vignettes I could paint! A lifetime of endless possibilities. Thank you for this inside look and interview. I enjoyed the interview itself as much as seeing this remarkable assemblage of unusual curiosities, because Mr. Vera's responses are so refreshingly straightforward, and because they so clearly reflect his reasons for the interests that he pursues. Thank you, thank you. And for the images, too. Wonderful. I could literally spend days in his shop... the inspiration alone would be priceless. Yes, I agree that the location has power and mystery! Federico wanted to be off the beaten path--so he is surrounded by creative people, but the streets are a little rough around the edges, which makes it so much more of a discovery. Hello, Denny-yes, wouldn't it be great to be locked up there over night and to prowl around his gallery, looking and lingering. Yes, as subject for painting, everything is a vignette, a collage, an inspiration. Dear Harrison-yes, Federico is articulate and highly engaging. He's also witty and light-hearted. He loves what he does--and has always had a very charming self-possession and composure that I truly like. He's fabulously talented--but never pretentious. Daniel,Dear--Yes, you must go! Michelin would say-'worth the trip, worth a detour'...make haste. Dear Patricia-Greetings from the West Coast. So happy you stopped by for a dreamy visit to de Vera. Hello, Terri-Yes...he has clients who stay for hours, and buy very very beautiful things and many of them. Federico will also custom-craft necklaces and other jewels...all handcrafted with beautiful old stones and lovely old gold. Be sure--everyone--to stop in, ask for Federico, and have a nice chat. You'll love him. Wonderful collections and fascinating interview! I love the Santos. Oh Diane, what a great selection of photos and the interview was excellent. 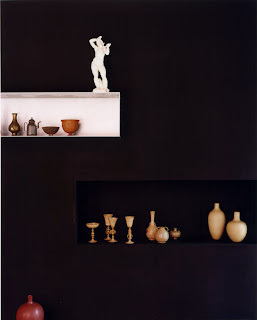 By looking at these pictures, I feel like looking at the Dutch still life paintings. I'm like a child in the sweet shop!! The methods of display are as beautiful as the objects themselves. How fun to come across him sitting on the stoop - love the choice of One Crosby. Hello, Karena- So pleased you love this worldly collection-of-collections. It's from all over the world--the best of the best. Dear ASD--Yes, I agree--walking into his gallery is like entering another era, century, country! It's like stepping into a Vermeer. Definitely worth a trip across the pond. Wishes to you. Hello, Michele--Lovely that you stopped by for a visit. Yes, I recall vividly the hot day, Saturday, in New York--dashing to all the favorite museums, and downtown, thirsty but energized. Hoping that Federico would be there--and going down to Howard/Crosby even not knowing...hoping. And there he was. We are old friends and have been through many adventures, and I was thrilled to see him. What an interesting man..how close to heart his home and work is. Love the way you introduced him and his shop and the photography is terrific - a real inside look! What a fantastic post! It is what I imagine the inside of Vermeer's studio would look like. The detail to displaying the objects is incredible. Thank you for sharing this. What a fascinating feature. I don't know which was more interesting, the shop and its contents or the interview. This looks like one of those magical places that come alive after the lights go out and the doors are locked up for the night. As a fan of your books and articles I am enjoying your blog after stumbling on to it. I'm an author of interior design books myself (Gibbs Smith Publisher) and a blogger for the past three years. I will post a link to your lovely blog on my blogroll. What an intriging post! I felt like I was right there inside. Don Freeman's work is gorgeous and learning more about De Vera's vision was a good read. I love the way he displays necklaces and glass and the fact that he's himself as a guardian for things until someone finds them. Sometime I feel that way about the one of a kind things in my shop. Lovely, Diane. Thank you for providing a glimpse into a fascinating place. As well as a man who has kept his childlike fascination with the world and beauty. One day I shall ask you to compile a list of very special places, I trust your opinion. Thank you all for your heartfelt and insightful messages. I love them and take them to heart. I am so very pleased that everyone is entranced and captured by de Vera's gallery...and some of you have visited. I like the comment from Clarity that to maintain an open and curious and 'childlike' mind is an art and an asset. I agree...'beginner's mind' is a zen concept--of being open to an experience, enjoying the moment, looking as if for the first time, seeing things with joy and pleasure, under all circumstances. Optimism is the key--whether finding a beautiful piece of Venetian glass in a flea market in Prague, or seeking out diamonds in India or a Japanese antique in Manila or Kyoto. Beauty is all around us. We must see it and focus on it and love it all. hello diane... i truly enjoy your blog ahd have nominated you for the kreative blogger award..
please reveal 7 things about yourself and then pass along to 7 others..
Fabulous interview Diane....What gorgeous objects to enjoy, xv. Diane..It was a real treat reading about the man behind one of my favorite shop in Soho. I have always had a soft spot for "cabinets de curiosite"and actually my last Jose Esteves lighting show was about "curiosites". Such an eye and immense talent, every object is shown to its perfection in the most sublime composition....out of the canvas of the Great Dutch painters.As a designer, store owner, traveller...I am always inspired and immensely respectful of the works of such talented individuals. just perfect.I could live on a little pillow(of silk) in the corner. Well, darn! I wish I had known about both your blog and this gem of a shop just last week when I was in New York! It definitely goes on the list for my next visit. Thank you for the great find. Dear Doriane, I am fond of this aura quite scientific of De Vera. He has the sense of research of material, shadows and lights. He is such as great European collectors of XVI and XVII centuries. I just want ad a word: gorgeous !!! Federico De Vera not only connects his vision of beauty and love of nature and shares it with us, he connects with people who respond to his unique artistry and who are also compelled by shapes and patterns. Years ago I visited his shop on Gough Street in San Francisco and happened to meet him. We were discussing the joys of collecting and I told him I collected eggs. He said, "so do I" and proceeded to go to the back room and return with a small granite egg. He gave me the egg as a gift. Every time I look at that small granite egg, I am reminded of his view that we are all just caretakers of beauty and that it is our responsibility to pass it on to others who will also be responsible guardians.